Cover your soil with plants, mulch or other natural elements to keep it healthy and thriving. Well managed soil takes care of your lawn for you. Exposed soil is generally unhealthy soil. When soil is left uncovered to bake in our hot North Texas sun or allowed to wash away during a rain, the living microbes, earthworms and other beneficial organisms just beneath the surface are in harm’s way. Soil that is covered with living materials such as ground cover, grasses or landscape plants, or simply covered in mulch, will be better equipped to handle the elements and keep their underground inhabitants safe. If your soil is cracking, then it’s overexposed and under-watered. Both mulch and living materials compost back into the soil, feeding the microbes below. Plants are your best soil cover-up! 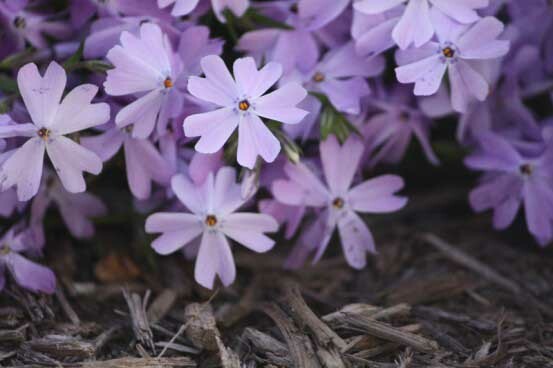 Established perennials, groundcover, annuals and shrubs shade the soil and protect the living microorganisms below. As your plants drop leaves, die back and decompose, they also add nutrients to the soil that will improve its health and texture. Growing vegetables? Add a cover crop between harvests. Clover, legumes and hairy vetch grow quickly and eventually compost back into the soil, adding much needed nutrients plus nitrogen. Live plants as a cover offer the added benefit of root systems that help to break up the soil and give those hungry microbes yet another source of food. Mulch is one of your garden’s best friends! A two to three inch layer of mulch over bare soil will help to keep plant roots cooler in summer and warmer in winter. Mulch helps to retain moisture to reduce water waste. If your soil is in the beginning phases of rehabilitation, it might not be absorbing water very quickly, leaving much of what is applied rolling down the street. Apply a thick layer of mulch to reduce water runoff. A quick cover of fresh mulch around the bare soil of your plants will also give the landscape a finished look. Mulch comes in a variety of textures and colors such as dark brown hardwood, red cedar chips, and more. Visit your local garden center to see your choices. Thinking of using the fun and colorful rubber mulch? We don’t suggest using it as a cover for your soil. As it breaks down, it leaches chemicals into the soil, doesn’t absorb water or compost back into the soil to feed the microbes, and is flammable.